You will need: yarn (100% cashmere wool; 115 m / 25 g) - 425 (475-500) g burgundy; hook number 2.5; pearl beads. Pattern for the hook. Knit according to the above scheme. Start with the loops in front of the right arrow, repeat the rapport of 10 points between the arrows and finish with the loops after the left arrow. 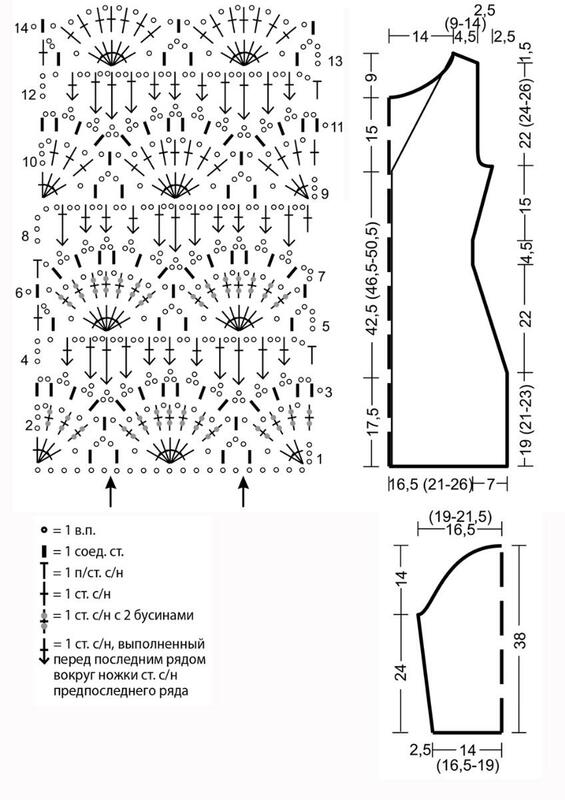 At a height of 1 time to perform from the 1st to the 14th p., Then repeat from the 7th to the 14th p. If the icons on the scheme are connected below, then the columns are knitted in the same loop of the base. Beads strung on a thread before starting work in the 2nd and 6th p., For each rapport 14 beads + 12 beads for the loops of the beginning and end of the row. Even rows = front rows, odd rows = purl rows. Right half of the back: Run a chain of 51 (61-71) vp + 3 inc. lifting (= 1st st. with / n 1st p.), then knit pattern for the hook. In the 2nd and 6th p. thread the beads on the thread. Through 19 (21-23) cm = 26 (28-31) p. from the chain of vp knit for tailing from the right edge 1 times for 1 p. less, then knit in each 2nd p. 14 times 1 p. Less = only 1.5 rapport. Then knit 6 p. without reductions and additions, then for the side bevels, knit with the right edge 1 times by 1 p. more and in each 2nd p. 9 times for 1 p. More = just add 1 rapport. Through 14.5 (16.5-18.5) cm = 19 (22-25) p. from the beginning of the lateral bevels, knit for the bevel of the neck from the left edge 1 times less than 1 point and in each 2nd p. 29 times for 1 p. Less = just subtract 3 rapport. After 15 cm = 20 p. from the beginning of the side bevels (= after 60 (64-68) cm from the dial-up row) knit from the right edge 1 times by 3 points less and in each 2nd p. 2 times 1 p. Less = just half the rapport down. After 22 (24-26) cm = 30 (32-35) p. from the start of armholes, knit from the right edge for the shoulder bevel 1 time by 5 (10-15) points and 1 time by 6 (11-16) points less. Left back half. Knit symmetrically to the right back half. Before. Run a chain of 101 (121-141) ce + 3 inc. lifting (= 1st st. with / n 1st p.) and knit according to the scheme. In the 2nd and 6th p. thread the beads on the thread. Through 19 (21-23) cm = 26 (28-31) p. from the dial-up row knit on both sides to be fitted 1 time for 1 p. less and in each 2nd p. 14 times 1 p. Less = just on both sides to reduce by 1.5 rapport. Next, knit 6 p. without gains and additions, then for the side bevels knit on both sides 1 time for 1 p. more and in each 2nd p. 9 times 1 p. More = just add on both sides 1 rapport. After 15 cm = 20 p. from the beginning of the side bevels, knit on both sides for the armholes 1 time by 3 points less and in each 2nd p. 2 times 1 p. Less = just subtract half of rapport from both sides. Through 14.5 (16.5-18.5) cm = 19 (22-25) p. from the beginning of the armhole not to knit the average 39 p. for the neck, and to knit in round 2 for rounding. 1 time by 3 points, 3 times by 2 points and 1 time by 1 point less. Through 9 cm = 12 p. from the beginning of the neckline, knit with the outer edge for the shoulder bevels 1 time by 5 (10-15) points and 1 time by 6 (11-16) points. less. The second side finish symmetrically. Sleeves. Run a chain of 61 (71-81) ce + 3 inc. lifting (= 1st st. with / n 1st p.) and knit a pattern for the hook. In the 2nd and 6th p. strung on a string of beads. Simultaneously knit on both sides for bevels in each 6th p. 2 times for 1 p. And in every 5th p. 3 times 1 p. More = just add on both sides half of the rapport. Through 24 cm = 32 p. from the dial-up row knit on both sides for okat 1 time for 3 p. and in each 2nd p. 8 times 2 p. Less. Through 14 cm = 18 p. from the beginning of the okat work to finish. Assembly. Run shoulder seams. Run the middle seam on the back, leaving the lower 17.5 cm for the incision. Tie a neck to 1 circle. as follows: * 1 tbsp. b / n, 1 p. skip, 5 tbsp. s / n in 1 loop of the base, skip 1 point, from * repeat. Sew sleeves. Run the seams of the sleeves and side seams in one step. Crochet the bottom edge of the dress, including the cut edges and bottom edges of the sleeves, as a neck.